The Swiss Agency for Development and Cooperation (SDC) has temporarily suspended payments to a civil society platform on migration issues. Financial conflicts of interest and accusations of pro-migration bias are being investigated. 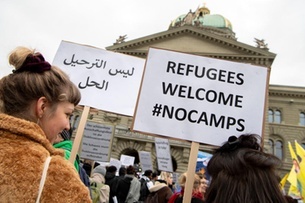 On Thursday, the Federal Department of Foreign Affairs (FDFA) confirmed that the Swiss Civil Society Platform on Migration and Developmentexternal link will not be receiving any further funds. It was created by NGOs Helvetas and Caritas in 2015 to promote dialogue on migration issues. Several NGOs are members, as well as universities and a large number of organisations of different diasporas and associations of migrants of all nationalities. Investigations have been opened due to internal conflicts over the project coordinator and accusations of “positive” propaganda on migration, financed by taxpayers’ money, which Caritas disputes. The FDFA has given the project managers until next week to respond to the various allegations. At the request of the SDC, the General Assembly of the platform, which was scheduled to take place on Thursday, has been cancelled. The SDC has budgeted CHF2.5 million (around $2.48 million) to support the platform over six years (until October 2021). Approximately CHF1.3 million has been paid so far.